Everyone is talking about “VPN” these days but if you’re like most people you’re probably confused about what a VPN is, how it can benefit you and ultimately how do you even get started to use one. With Virgin Media being one of the biggest internet providers in the country we’re taking a look at how you can use a VPN specifically with Virgin Media. While this guide will be suitable for other ISPs in the UK, we’re focusing on using a VPN with Virgin Media specifically. So let’s find out how to use a VPN with Virgin Media broadband and answer some of the questions you’re bound to have. Let’s start with the basics, understanding how to choose a VPN for use with Virgin Media. Essentially any large VPN provider will be suitable for use with Virgin Media because most of them offer standard modes that are compatible with almost all ISPs in the western world. Although there are some internet restrictions in the UK and on Virgin Media they are nothing like countries such as Russia, Iran or China. The first thing to remember is you really can’t go wrong choosing a VPN for use with Virgin Media. However, choosing a good VPN provider versus a bad one is something completely different and we’ll explore that later in this article. Using a VPN with Virgin Media is pretty simple too. Once you’ve signed up a VPN provider you should download their software or app for your device. All the leading VPN providers offer apps for Android and Apple (iOS) mobiles and tablets and software for traditional computers and laptops running Windows or MacOS. Most VPN providers offer three connection modes, called “protocols”. These are usually PPTP, L2TP/IPSec and OpenVPN. In layman’s terms they’re different types of VPN connection but essentially they all do the same job. However, some of these protocols are newer and do that job more efficiently and more securely. For ease, using OpenVPN is recommend. It’s safe and secure and also if you use a good VPN provider like IPVanish then you won’t suffer much speed loss. There’s also no fiddling around with settings which is why we strongly recommend you use it. Often VPN apps and software use it by default so there is no issue there. If for some reason you need to use PPTP or L2TP/IPSec then you’ll need to change some settings on your Virgin Media Super Hub. The most common reason will be if you’re using an iPhone or iPad as most VPN provider apps for these devices make use of IPSec rather than OpenVPN. Log in using the username and password printed on the back of your Virgin Media Super Hub. Then go to Advanced Settings -> Security and access the Firewall Settings. 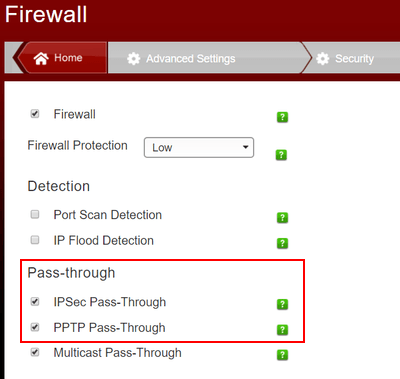 You’ll see options for “PPTP Pass-Through” and “IPSec Pass-Through”. Tick both of these so they are enabled and apply the settings. 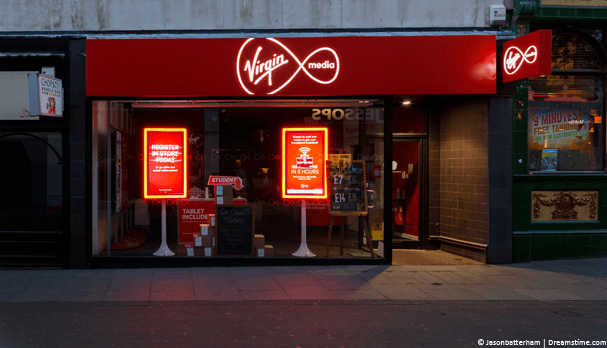 As we explained earlier, almost all commercial VPN providers will work with Virgin Media. There is however a huge difference between good VPN providers and bad ones and unfortunately, they’re all priced roughly the same. We’ve tested all three with Virgin Media and all offered good speeds with a decent selection of servers both in the UK and abroad covering you for almost all needs. Without a doubt one of the biggest request these days is people looking for a VPN solution while using Kodi on their Virgin Media account. While most people know Kodi is completely legal there are circumstances where legality becomes a grey area. What you do with your Kodi installation or Kodi box is your own business and for that reason, you’ll want to keep your viewing habits private. The good news is, using a VPN with Kodi on Virgin Media is no more difficult than using a VPN with any other device on Virgin Media. The easiest method to use a VPN with Kodi on Virgin Media is to use the VPN provider IPVanish. IPVanish has apps for Android which makes up the majority of “Kodi boxes” and also for Amazon which covers the Fire TV and Fire TV Stick which generally makes up the remainder of Kodi boxes. This makes the entire process simple, download the required app and connect to a VPN server. The result is that what you watch remains private and can’t be linked to you. That’s not to say we’re advocating watching anything illegal, mind! A VPN is essential these days for use with Virgin Media so it’s important to understand just how easy they are to use. Long gone are the days where you had to fiddle around with complicated set-up. These days, you can simply pop an app on your device that does all the hard work for you and forget about it. Along with protecting your privacy a VPN can also help you access blocked or censored websites, watch TV from abroad and a whole host of other things. Our suggestion, if you’re thinking of getting a VPN for Virgin Media then do it, the sooner you start protecting your privacy, the better. They really aren’t as complicated to use as you may have first thought.